Third Grade Gridiron and Lessons with Laughter posted today on the sixth chapter of the Daily Five book. If you haven't read up on the first 5 chapters, head on over to We Read, We Blog, We Teach to catch up. There is some GREAT stuff over there on the Daily Five! Chapter Six focuses on Work on Writing and Word Work. I love these two areas of the Daily Five, because there are so many ways to be creative, and SO SO SO many different things you can do with your kiddos. Here are a few things I did this past year for Work on Writing, and a few I hope to incorporate this next year. Class Topic Journals--With the new CC standards, we are required to teach (or at least touch on) each of the three types of writing each nine weeks. So, instead of doing topic journals like, my favorite vacation/animal/birthday, I chose to have three topic journals--Narrative, Informational, Opinion. After learning about one of the types of writing, I put that journal out for my students to write in during Daily Five. I really liked that it encouraged the students to use the different types of writing about which they had learned. I also wrote a story in the front of each journal, so that the students could see an example of each type of writing. Topic Jar/Free Write--I allowed my students to either free write, or choose a topic out of the topic jar. I am redoing the topics I have in my jar this year, again, so that I can encourage my students to use different types of writing (I found that my students almost always wanted to write narrative stories!!! Do your students do this, too?). I am borrowing some writing prompts from The Learning Institute's quiz builders to use for my topic year. These prompts are written similarly to how students will see them on tests, so I feel like it is a great way for them to practice! KidBlog--If you have not checked out Kid Blog, you need to head over there IMMEDIATELY! It is the coolest! My kids love getting to write on the computer, and Kid Blog provides a safe environment in which they can write and their friends can read their writing. It also has a cool feature where you can allow parents to read their child's blog, if they want to. 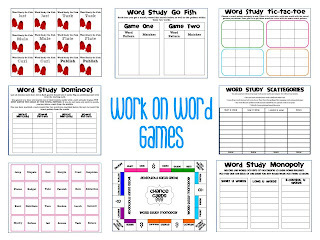 There are many sets of Word Task Cards out there, and this is a great idea if you want your students to have a predictable and reliable activity for word work. Unfortunately, my students weren't terribly excited by this, but I have some ideas to make it more fun this year--let my students use dry erase boards to complete the task cards, allow my students to use marble or magnetic letters... that's all I've come up with so far. But here is a good example of a set of task cards to use. This requires a little bit more work, but I created games this past year that go with our spelling pattern. I spend two weeks on each pattern and have three different spelling lists for differentiation. We spend a lot of time focusing on reading and writing the words and strategies that can help us with those two things (breaking words into syllables, identifying types of syllables, etc.). I usually have three games for students to choose from, and they play these games with a partner. After the first two or three units, the students are familiar with the games I provide, so there is no need to introduce new games each unit. You can see an example here. I plan on uploading more of my Work on Word games, but an stretched for time tonight. :) BF getting cranky, lol. 3. I also let my students play Boggle once during a two week period. It's fun, and they love it! Alrighty, headed down to the movie room to hang out with my dear, patient boyfriend. He's so good for putting up with my and all my teacher antics!! Love him! P.S.--I don't have too many followers, but I'll give the first three people some Work on Word games if you'll leave me your e-mail address and some feedback... AND gimme a shout out on your blog! Thanks! Thank you for sharing your thoughts on the Daily 5 Work on Words section. I love the activities you have created- especially word monopoly. Definitely work getting! Thank you so much for your kind comments! Your games are on their way! Guess I'm too late. Love your blog! Meg and Deb--Your games are on the way! Enjoy! !